I am on the roll this year for Japan travels. Since the early July trip to Kamakura and Mount Fuji area, I’m back in Hokkaido again! I last visited 3 years ago with family where I went to Furano for the Lavendar flowers and also went to Noboribetsu for their Edo Period theme park. This time I only have a very short weekend trip, so I won’t be going very far away from Sapporo. 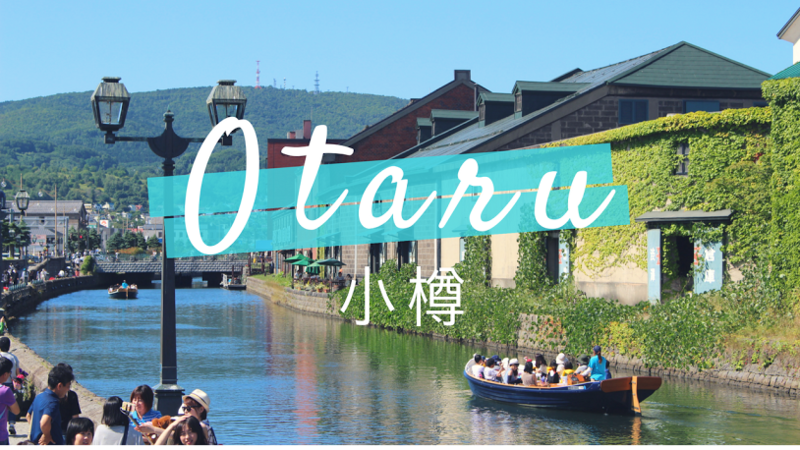 But this time, I was able to visit Otaru! It’s a 30 minute train ride Northwest of Sapporo, a little town famous for its canal. Otaru is a city just 30 minutes by express train, Northwest of Sapporo. It’s famous for it’s canals that run along the ocean coast. The train ride was very scenic! We first went through the suburbs of Sapporo, then soon we reached the North coast. The train ran mostly right at the edge of the coast, and across the ocean you could see Russia! Halfway through you start seeing small beaches where people are swimming here and there. As you pass by, people wave to greet you! I love this about Japanese people, they are so friendly! I got to Otaru around late morning time and the sun was already blazing hot. I visited Ryugu Shrine just Northeast of the station. Ryugu means Dragon’s temple. It was a small temple that was kept pretty well, but there was no one around. I took some photos quickly and returned to Otaru Station to take a bus from there. A little bit about transportation IC cards in Japan, they are used for bus, rail, and trams. 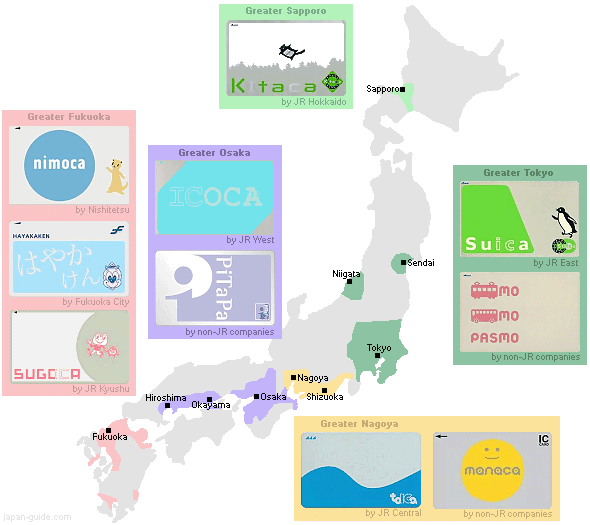 Each region has their own card as seen in the photos here: http://www.japan-guide.com/g8/2359_map_1411.png I had an ICOCA card from Osaka, and it’s mainly used in the Kansai region. It’s a blue and silver card with the icon of a duck. In Tokyo area they use SUICA, and other regions also have PASMO and in Hokkaido they use a green and white card called KITAKA. Most cards are interchangeable in different regions and you should have no problem using it everywhere. To get to Mt. Tengu, you can take Bus #9 from the Otaru Bus station platform 4. They sell all kind of package tickets there, including daily tickets or tour around city tickets. I was only taking the bus twice so I just used my ICOCA card. The bus was a pretty short ride, maybe just 10 minutes. But if you were to walk in this heat for an hour you’d probably faint. We stopped near the bottom of the Ropeway, the entrance is just to the left of the bus stop. However I was going to climb up instead, so I followed the path along the right side behind this white 2-3 story tall building to the hiking trail. There are signs along the way but there are in Japanese only. Since GPS still works while in airplane mode, I used google maps to help me navigate the directions. To climb to the top of the ropeway, you won’t need to go to the summit. The climb to the ropeway is just 30 minutes. Around 20-25minutes, you’ll be prompted to take a right turn down towards a shady road covered with trees, don’t take that route, and continue up to the left where you can see the ropeway lines. You will first run into the long slide on the small hill. To ride the slide it’s around 400 yen for an adult, and I’ve never rode something like that so I gave it a go. It went super-fast!! It was really fun as well, and they also have a photo camera set up so you can pick up a picture of yourself at the end. If you head towards the ropeway station, directly across from it there’s a chipmunk garden, 100yen for entrance. I’ve seen chipmunks all my life growing up in Iowa so I didn’t go in. Past that is the Tengu Temple. Tengu means “heavenly dog”. Its main feature is its really long and slender nose (kind of like Pinocchio). Usually the Tengu masks come in a bright red color and vary from region to region. Here at the Tengu Temple in Otaru, you are supposed to rub his nose to wish good safety on travels and transportation. There is a small shrine between some trees. The Omikuji is inside the Ropeway station. This time I picked a Daikichi! Super Lucky! It is the highest grade of luck you can draw out from an Omikuji. I also got some souvenirs for friends since the Tengu mask is pretty cool! After taking the Ropeway back down, I took the bus again which goes to the Otaru Canal. It was just around late lunch time and the area was packed with tourists! The whole of Japan, Korea, Thailand, Hong Kong… everyone seemed to be there! All the restaurant waiting lines were hours. I took some quick photos of the Canal as the sun was blazing down, and I found an old warehouse remodeled into a food court. It was indoors with no windows or views, but the Uni (Sea Urchin) and grilled Salmon rice I had was so good! After lunch, I walked east to this shopping street area called “Sakaimachi”. It’s an outdoor shopping area around 500m long. There’s tons of stores there ranging from food stalls, to music boxes, souvenirs, local crafts and goods etc. There are some products made of stones here so I picked up some pink ones, good luck for relationships! Most of the buildings on these street are wooden and carry a slight European feel to it, and it was just pleasant to walk through this street. Towards the east end of these street, there is a clock tower and a dark brown wooden color building. It’s a massive 2 floor music box store. Although I don’t really collect music boxes, it was super cool to look around in there! There were sushi shaped music boxes, also one that looked like a telescope but it’s actually a kaleidoscope and the stones on the bottom turn in circles so you keep seeing different colors while the music plays. If you continue to walk east and then south, you’ll reach Minami Otaru (South Otaru) station. From there you can still board the express train back to Sapporo.